Low Carb Strawberry Margarita Gummy Worms. All the fun of your favorite childhood treat with the adulty (yes, I went there) bonus of tequila! All the fun of one of your favorite childhood treats, with a low carb boozy spin. 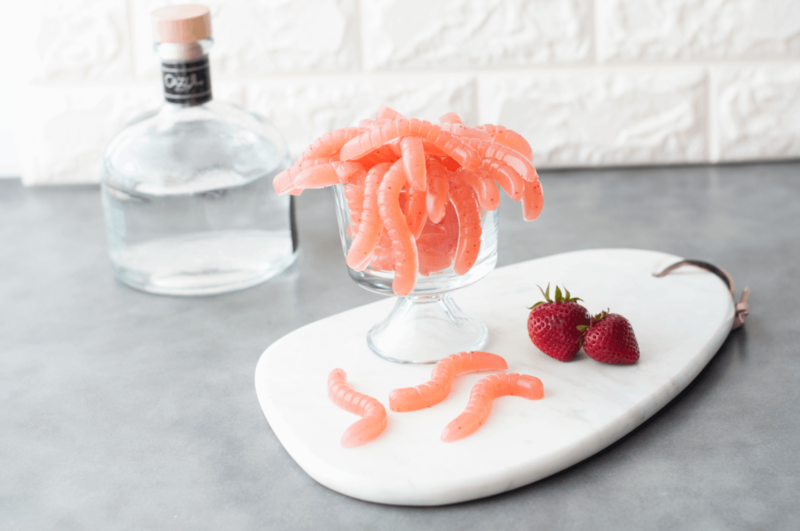 These Low Carb Strawberry Margarita Gummy Worms are the perfect surprise treat for the tequila lover in your life. But don’t be fooled by these silly looking low carb gummy worms, they really pack a punch! 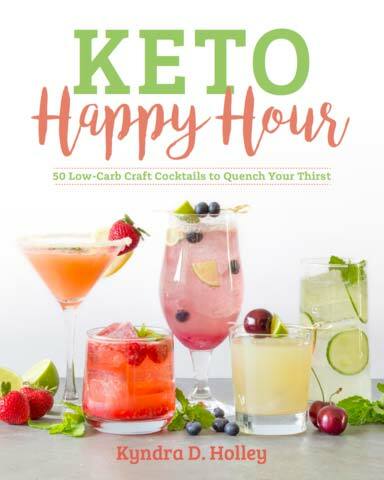 I am excited to preview another recipe from my upcoming book Keto Happy Hour – 50+ Low Carb Craft Cocktails to Quench Your Thirst. One of the questions I get the most often (besides how to order low carb at Starbucks) is how to work alcohol into a low carb diet. I got the question so often in fact, that I decided to just write a book about it. Keto Happy Hour has a little something for everyone. It is jam packed with scratch made mixers, cocktails and even some delicious low carb appetizer recipes. KETO HAPPY HOUR: 50 Low Carb Craft Cocktails to Quench Your Thirst. This adult version of a childhood favorite really packs a punch—sweet, boozy, and silly all at once. Combine the strawberries and tequila in a blender and pulse until smooth. Pour the strawberry-and-tequila mixture into a medium saucepan and set over low heat. Add the gelatin, erythritol, and lime juice and whisk to dissolve the gelatin and combine the ingredients. Continue to heat for about 10 minutes, whisking frequently, until the mixture becomes pourable. It will start out very thick but will become thinner and smoother as it heats. Transfer the mixture to a measuring cup or a bowl with a pour spout. Quickly pour the mixture into the gummy worm mold and transfer to the refrigerator. Refrigerate for 10 to 15 minutes, until set. Pop the gummy worms out of the mold and enjoy! Store le overs in the refrigerator for up to a week. Well, I know what I’m making tonight! I’m already so excited for those buffalo chicken poppers, but I hope to see a low carb White Russian in the book! It’s a guilty pleasure! Can’t wait for February 20th so my copy will be here! Looks like an awesome book might have to pick up a copy when it comes out! Lol will have to to make these gummy worms when I’m over this bug I have. Thanks for the inspiration! Brand new to a low carb lifestyle. Loving your Instagram and will definitely be getting your books as I feel more comfortable with the basics of Keto. Thank you!! This is making my mouth water! I am new to the Keto world and still learning a lot every day! I can’t wait to see this book and I hope there is a low carb fuzzy navel recipe! Yummy! Would like to find a good low carb cracker recipe. Low carb margaritas and tortilla chips. Love this! Looks delicious. Would love to see some keto Bloody Marys in the book! So excited there’s a Moscow Mule recipe!!! Can’t wait for the cocktail book!!! I’m really hoping to see some keto versions of some of my favorite drinks: Moscow mule and vodka cranberry! Love the blog! I can’t wait to try these! Your whole site and blog has made my low carb life so much more manageable, Thank you! I would like to see a keto Bloody Mary recipe in your book. I love all kinds of margaritas. Strawberry-mango is my favorite. What fun! I can’t wait to try! Love all your recipes! Maybe a recipe for something similar to Baileys! These look so good and I really miss gummy candies. I hope you’re new book includes blended drinks like a nice strawberry daiquiri. One of my fav summer drinks is a daiquiri with whipped cream on top. Two of my favorite things … Tequila and candy! Can’t wait to try these! How exciting! A little fun, sounds good to me! I can’t wait to get this book! Looks amazing! The thought of eating gummy worms makes me so happy. Love your recipes. Can’t wait to get my hands on this book! I’m hoping for a GOOD margaritas recipe! Oh my! I have got to order a gummy worm mold! These sound amazing! I love dairy but wonder if it’s stalling my weight loss. I would love to see some appetizer recipes without dairy. Maybe a low carb veggie pizza. 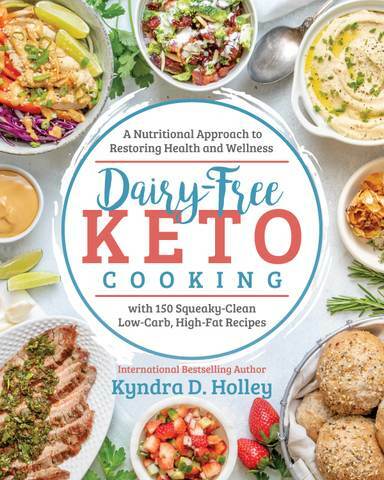 Your book is on my list for keto books to get next. Would love to see a White Russian. Can’t wait to get this book! Nachos! I’d love to see a lemon drop recipe!!! ???????? Gummy molds…. I need gummy molds! I have other molds but I’m not sure what effect the size would have on that little boozy aspect !! Love!! Can’t wait for this book. This looks delicious and super easy! I’d love to see a mimosa inspired recipe! I’d love to see a keto Moscow mule! Love these gummies! Hope the book has some yummy wing appetizers too! Wings always go with drinks! There is a delicious Crispy Baked Garlic Parmesan Wing recipe in there. Looking for great appetizers that will pair well with margaritas……hosting a taco night…with lettuce cups and tortillas.. Would love to have a few options that everyone loves and no one realizes it’s Keto friendly. I’ just entered the giveaway and tried the link to comment on the post, it wouldn’t bring me anywhere so I’m hoping this is ok ???? Anyway, I came across your site and followed you on Instagram. Your posts and recipes are amazing! Thank you for making this doable! Hoping for something sweet! Can’t wait! Can’t wait to make a Keto friendly Bloody Mary???? Hoping there is a a virgin strawberry daiquiri for my daughter! These look so yummy!! It’ll be hard to stop at 1 serving! It’s in there! and it is DELISH!! I would love to see a spinach dip recipe with some tasty crackers! These gummy worms look so fun! I love your blog and cookbooks. I’d like to see some non-alcoholic drinks using Torani sugar free summer flavor syrups. I can’t wait to see all the recipes I can’t get enough of all this great keto friendly food that I can feel good about taking to a party! Would love to see some low-carb daiquiri options!! These look and sound so yummy!! I hope to see some kind of “potato” skins recipe or loaded potato inspired appetizer. Awesome giveaway!! I love Swerve. Love your blog and emails! Would love to see a keto mozzarella cheese stick and “potato” skin. 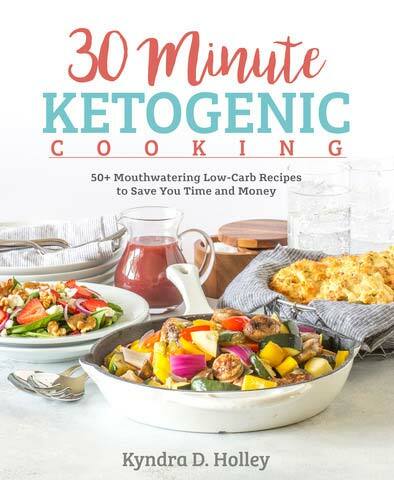 I am so excited about this book because I see you have already confirmed there is a keto bloody mary for my hubby and a keto margarita for me. 🙂 We will be trying the buffalo jalapeno peppers our Super Bowl snacks. I love bourbon based drinks. Hoping there is a low carb Manhattan out there somewhere. I am going to have to order this book! Anything with rum sounds yummy to me!! Would love to see pretzel bites with a beer cheese. I have yet to make a Keto version but my husband would be in love if I found a recipe. Pretzels are in there. And there is a beer cheese soup here on the site that makes an amazing dip. A sangria recipe would be great. I love gummy worms! This would be such a great treat! I love you incorporated more than just drinks in the book. Can’t wait to get it! I want to see more keto sweets! Thanks for sharing on Instagram. Great recipes and encouragement. fun recipe! can’ wait to try! I’d say some kind of crackers to go with a dip! I would like for you to do a recipe for a low carb version of those sausage bisquik appetizers!! I’d love to see some non alcoholic drink recipes… They are usually so sugary! Any variation of a margarita ???????? These look awesome! I haven’t found a recipe of yours I haven’t liked!! I don’t drink much/at all, but I would like to see virgin drinks if possible? Any chance on making a low carb version of the Cosmopolitan? Love your recipes, I love any drinks with vodka! Definitely making these for the May birthdays, they’ll love them. Ordering those gunny work molds! Could I sub water in place of Tequila for my kids?? What a great idea! I have yet to make gummies and I need to get on that! Can’t wait to try these recipes!! My brain stooped working after I saw strawberry basil lemon drops!!! I discovered lemon drops right before I went keto a year ago and I haven’t had any cocktails! I can’t wait to try. As for food, I would love to see some yummy crackers that are good with dips. The swerve giveaway is so awesome! I would love a low carb strawberry margarita. Is that possible? I may have to try Gummy Bears with this… the worms just look too real!!!! Looking forward to the Bloody Mary Recipe. Need a good White Russian recipe too!!! Thank you for a Giveaway! These look like ao much fun!! Mmmmm everything about this makes me ready for summer! I love all of your posts; you are such an inspiration! I would love to see a “Frose” recipe!???? I love gummies (and booze) – would love to see some Valentine’s Day recipes (cheesier the better – literally and metaphorically) to help me have a romantic meal AND stick to Keto. I’d love a low carb tangerine margarita …all kinds of fruity margaritas!! I can’t wait to try these! I love gummies! I love strawberries! I loooooove tequila! ???? Awesome giveaway! These gummies look to.die.for! I am new to Keto. Can wait to try some new recipes. I can’t wakt for this book! Oh, a low carb bloody Mary would be devine! I need this cookbook. Missing my coffee liqueur at special times. Oh wow! This book looks like a must-have! I’dlive to see a Cosmo recipe! Love swerve! Love all of your recipes. How about a key lime martini!! I was watching this on your Instastories and it even got my non-Keto hubby’s attention. My birthday is the 17th. I put it on the top of my wish list! I can’t wait to make lemon drops and Mocow Mules! Thank you so much for this book! I can now have something other than a plain vodka! I have never made any of the drinks listed, so I will be excited to try them! Thank you for making all those unhealthy childhood Favorites much more keto friendly! CANT WAIT FOR book! I am with a lot of commenter s already- but margaritas for sure!! Keto adult beverages?! Sister friend you are speaking my love language! These look amazing!! We don’t do alcohol so I wonder if I could adapt sans alcohol? I can’t wait to see more candies like this!! These look devine! I’m hoping to see a low carb white Russian! These gummies are certainly on my to make list! Gummies are one of the things I miss on Keto.. I would love to see a recipe for an Amaretto Sour, it’s my favorite sweet drink. I can’t wait to check out the book! These look amazing! Great little party treats! Gonna try this. It’s hard completing giving up alcohol for my Keto lifestyle. It will be nice to have choices especially summer cocktails with tapas. Thanks! I totally miss gummy candy and these caught my eye from your Insta story!!! How exciting!! We definitely have to be creative with keto but it is never dull. Thank you for all your recipes! Really looking forward to your new book! what a great giveaway! Can’t wait to make those for summer! An espresso martini would be awesome! I know espresso and vodka and some cream but what to add for something sweet??!! Youre instagram and blog are among my top fave 3 in the rather large keto ‘world’ right now. Love your heart and passion to share with others … Authentically. 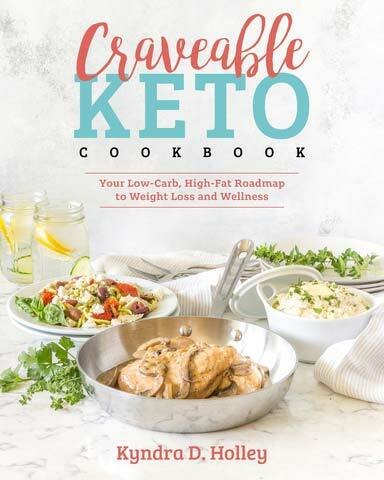 Craveable Keto is on my current wish list !!! Thank you so much for the kind words. It means more than you know. Well these just look like so much fun! And delicious! I love to see some lovely mock tails like a low calorie pina colada!! Those gummy worms look delicious! As for a recipe suggestion: perhaps a good way of preparing artichoke with a dip? Artichokes are one of my fave appetizers. Moscow Mules, tequila drinks, so exciting! Woohoo! Can’t wait to try these! Thank you! How fun!! Not only do they look delicious but they look great for a party I am throwing next month!!! And sweets without the sugar, yay!! I’d love to see some low carb/fathead dough appetizer pastries! Love the idea of making low carb gummies so much, I just ordered a set of molds with a pipette! You had me at gummies!!! It would be tough to share these beauties! These would pair well with a guacamole and some keto “chips”! Hope to see that in the book! I just stumbled across your page and just started keto about 3 days ago! I’m so excited to try your recipes!!!! I would like to see bloody Mary’s and pigs in a blanket. Who doesn’t love gummy worms??????? Is there a way to make lemon martini low carb ? Totally awesome! Wish the book tour was coming to canada! This looks and sounds amazing!! I’m thinking I will make it, without the gelatin, so I can drink it rather than eat it 😉 Super excited to discover more of your keto kocktails (& will probably need your book!) . Kyndra, I have made many of your recipes with great success! Thank you for your hard work! Sounds like maybe you used collagen peptides instead of gelatin. Can you tell me what your container says so that I can help troubleshoot?